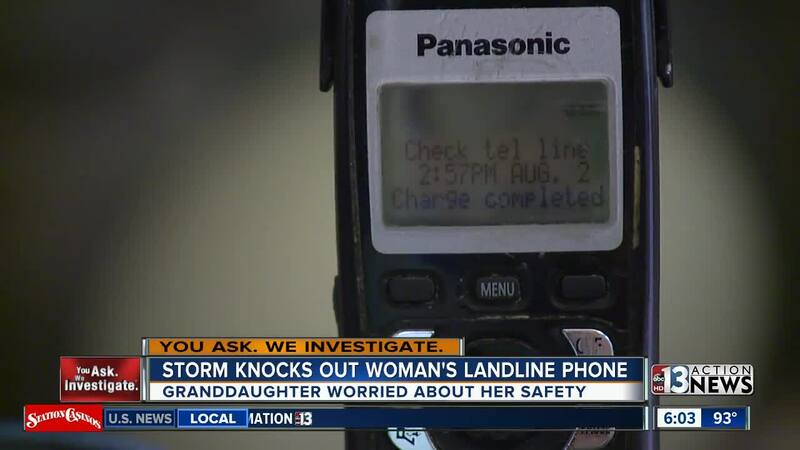 A Las Vegas grandmother battling ALS says she has been without reliable landline phone service for more than two weeks after a storm. Carissa Humphries says her 75-year-old grandmother Doris lacks the manual dexterity and eye sight to use a cell phone and needs a landline phone. "I am terrified that this situation is going to lead me to find my grandmother dead," said Humphries. "Without a home phone available to her, if she has an emergency, she has no way of getting a hold of emergency services," she added. Carissa says she called CenturyLink on her cell phone, but after two weeks, the problem still had not been corrected. A spokesperson tells Contact 13 technicians had been out to the property 4 times but the utility pole is located in a neighbor's yard which contains dogs that are known to be aggressive. Humphries says as of 5:30 p.m. Thursday, technicians made an emergency patch and phone service has been repaired, but crews will need to return to make permanent repairs.